The teams are the same. The venue is neutral again. The caliber of teams are not the same. The Black Bears are struggling to get wins and UMD is trying to piece together a run to 0.500 win percentage. This may be the night for UMD to move to even when they face a down Maine team in the Florida College Classic. UMD has dropped to third most penalty minutes per game in the nation. Maine is currently fourth. UMD certainly has the numbers for offense against the second to last offense of the Black Bears. UMD's problem is offensive consistency. The Bulldogs are playing Maine at the right time looking for a win to reach 0.500. Around the WCHA and Picks by Fiskness. @afiskness got his picks in early and was surprised like many probably were by first place Saint Cloud in the WCHA losing to last place RPI in the ECAC. The Huskies lost 4-3 at home with a rematch tonight. The Christmas holiday is now over and the holiday hockey tournaments are set to begin. There are also a few non-conference match up with WCHA teams involved as well. It is hard to predict how the tournaments will go and different teams could result in different outcomes. Here are my picks for the weekend. Rensselaer Polytechnic Institute at St. Cloud State: SCSU sweeps at home. UNO at Quinnipiac: UNO splits with the Bobcats. Boston University at Denver: The teams play to a tie in the single game series. Maine vs. UMD and UMD vs. either Ferris State or Cornell: UMD beats Maine and then falls to Cornell who wins the Florida Holiday Classic. Brown vs. Minnesota State University Mankato and MSUM vs. UConn or American International: MSUM win both games and wins the tournament. The second win will be over UConn. Michigan vs. Michigan Tech and MTU vs. either Michigan State or Western Michigan: Tech is beat by Michigan and beats MSU for 3rd place. The Broncos take the title of the GLI. Air Force vs. UMTC and UMTC vs. BC: The Gophers beat the Falcons and fall short to the Eagles of BC who takes the tournament. It was not a surprise but UMD is now looking for a new Athletic Director and a new head football coach as Bob Nielson has decided to move on in the head coaching ranks. Starting immediately Bob will be the head coach at Western Illinois University Leathernecks in Macomb, Illinois. There is a nice story about Bob on the UMD web page. This is a hockey blog and this departure does effect UMD hockey as Bob was the Athletic Director and a one of the faces for getting the Nation Collegiate Hockey Conference (NCHC) started. This will raise some questions among UMD fans who now have to hope that the University will find the appropriate leader as Men's hockey is moving to a new conference and one that will continue the winning tradition UMD has enjoyed under Bob's years as AD. I must admit that I have only meet Bob on one occasion which was at the 2010 NCAA Frozen Four. I was looking for a spot to take pictures prior to the start of the game when Bob was standing taking in the scene at the Xcel Energy Center. I congratulated him on his 2nd NCAA Div II championship and asked him what was harder being the head coach of a team prior to a championship game or the AD of a team prior to the game. He said he was more nervous being the AD than the coach. We then continued to briefly talk about change in media and he asked about my role. I mentioned to him that I was a UMD alumni and he then asked about my day job. In the conversation he seemed generally interested and a very nice person. After then game the scene in the locker room was very energetic. Bob was standing outside the looker room letting the players celebrate when I congratulated him on the win and he remembered our previous conversation. He remained in the background accepting the congratulations and giving them back to others as people went in and out of the locker room. I could see he was very happy and knew his place to let everyone involved with the team to take in this beg win. We wish Bob the best with his new team. For all of the Bulldog fans living in the Twin Cities area, next year Bob and his new, team the Leathernecks, will be playing the the Gophers at TCF Bank Stadium on September 14, 2013. This season’s Bulldogs team has what it takes to compete for top half or better in the WCHA, but hey just cannot put it together. An absolute maddening season so far for the fans and most likely the players. If not, they need their heads checked. The crazy part of the season so far is the powerlessness the Bulldogs have on the second night of a series. It is not a Saturday thing necessarily, even though they are 0-5-2 that night. UMD is a stunning 0-6-2 on the second night. Put the second night streak aside. The latest loss on Saturday to Bemidji State shows how baffling the team is. The Beavers are the dregs of the WCHA, at least at this juncture of the season. For UMD to be manhandled and kept at bay as much as the Bulldogs were is sickening. It makes for terrible hockey to watch and difficult to get revved up for UMD Hockey games. I felt our report card for the first half of the season was a little harsh in some sections, but our staff went with a consensus and it is turning out to be correct. Unfortunately correct. This would normally be a weekend where I would be talking about cleaning up and taking advantage of a weak opponent. But two big factors are standing in the way from those sentiments: the games are in Alaska and UMD just cannot string two wins or two nights of scoring goals together. UAA is vulnerable, but UMD is also. String two straight nights of good effort and play is turning out to be a huge roadblock for the Bulldogs. Maybe their best two games of the season came in Grand Forks against North Dakota. But that resulted in a tie and OT loss. One point did not equal the effort put forth. UMD needs to find a two game stretch to put together two wins. And those have come the last two weekends at Michigan Tech and home against Bemidji State. Both were only one win. The run of playing against bottom teams is nearing the end. UAA is the next opportunity of the waning amount of opportunities. UMD has now dropped to second in the nation in penalty minutes per game. Top power play in the WCHA is the Bulldogs', last rated penalty kill is the Seawolves'. 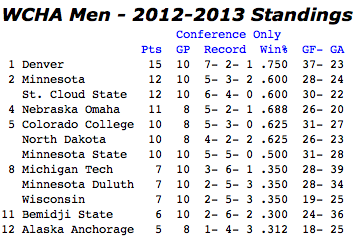 UMD's conference record is good for 8th place tie compared to UAA who is 12th and last. Around the WCHA and Picks by Fiskness. As George Bush once said "There's an old saying in Tennessee — I know it's in Texas, probably in Tennessee — that says, fool me once, shame on — [pauses] — shame on you. Fool me — [pauses] — You can't get fooled again." Well the Bulldogs have continued to do that to me all season. The Bulldogs are a pretty good team that is not playing to their ability. As a team they do not seem have the edge to push them to prevail and appear not give it their all every night. Until they decide not to quit and go through the motions the will be a .500 team or less. Non-conference Games:Alabama Huntsville at Wisconsin: The Chargers are not a good team and even though the Badgers haven't played good recently they will sweep this weekend. WCHA Conference Games:North Dakota at Michigan Tech: North Dakota has not been able to put together an undefeated streak longer than three games all season and the Huskies have played a bunch of tight games against better teams.That should mean a split, but I don't think Tech is playing well enough for a split. So, I will go with a tie and a North Dakota win giving North Dakota 3 points for the weekend. Denver at Bemidji State: Is Denver going to get back on track? If the Beavers play their slow muck it up games style and Denver gets sucked in they will have a tough time winning. I will say a split. Minnesota State at Omaha: Battle of the Mavericks, red versus purple. This is good match up to see what the Mavericks of Mankato are made of as they having been playing a pretty light schedule recently. Omaha is playing very good hockey and at home will the Red takes 3 points. Colorado College at St. Cloud State: The Huskies lost a barn burner and then beat the Mavericks of Omaha in a low scoring game last weekend. Mean while the Tigers came from 3 points back to earn a tie and salvage a point in last weekends series against the Gophers. Not much analysis, this series just looks like a split. Minnesota Duluth at Alaska Anchorage: The Bulldogs have not been able to get wins on back to back nights in a series and I don't think that will change against the Seawolves. The Seawolves are not a great team, but they did beat St. Cloud a couple weeks ago so I will go with a split. Last weekend the Bulldogs regained life in the WCHA. The three point weekend buoys the spirits of fans and should help the team to gain confidence going forward. But now the rubber hits the road. It is a home weekend and an opponent who is on the ropes. Bemidji State is 1-6-1 in their last eight games. Their win and tie came in one weekend against Alaska – Anchorage in Bemidji. During that stretch, the Beavers have 18 goals for and 31 goals against. On the ropes and one point out of last in the WCHA. BUT, BSU is also one point behind the Bulldogs. So as weak as the Beavers appear, they are in the same tier as UMD in the standings. So as the Bulldogs seem to be on the rise and Beavers headed downward, they are still in the same tier of the standings. It is another prime weekend for UMD to break out and try to move up in the standings. Haves and Have Nots. The conference schedule is approximately one-third complete and the top half and bottom half are forming in the WCHA. The current breaking point is 10 points where three teams are tied. Two are in the upper half and one is in the lower. The log jam in the middle and the top-bottom gap will make it difficult for UMD to move into home ice. The teams in the upper half look strong at this point, but all the Bulldogs can do at this point is take care of themselves, and win games and series. Scoring Early. UMD has the advantage in scoring in the first period outscoring opponents 20-16. After that, UMD is outscored 10-13 in the second and 10-14 in the important third period. Most importantly, UMD is a -1 in overtime going 0-1-3. Both UMD and BSU are very comparable in goals allowed, but the Beavers have the saves percentage edge. BSU sees a lot of shots and UMD likes to shoot as they have outshot their opponent in all games except the two game s against Notre Dame. UMD takes penalties more than any team in the nation, but they can kill them fairly well. When Bulldog opponents take penalties, UMD is learning to make them pay rising to 5th in the nation for power play. It was almost a year between shorthanded goals, but UMD got one last weekend at Michigan Tech, the same venue as the previous Bulldog shortie. Around the WCHA and Picks by Fiskness. I was happy to see that my picks for the Bulldogs/Huskies games were wrong as UMD earned 3 points. It was a much needed win for UMD and I do expect to see a carry over to this weekend against the Beavers. We are starting to see what the teams are made of and what to expect for the remainder of the year from each team. The thing most apparent to me is the parity of the league from top to bottom. It does not look like one team is going to run away with the MacNaughton cup unless something really clicks for somebody. It seems pretty safe to pick split each week for every game. Alaska - Anchorage at Minnesota State Mankato: The Seawolves are hot after beating the Huskies last weekend in Anchorage. The Huskies took the early lead and went into defense mode to hold on for the win. The Mavericks are one of the teams on a for game winning streak. The Mavericks have confidence right now and playing at home will give them an advantage. I do expect to see the Seawolves play well enough to earn a split. Bemidji State at Minnesota Duluth: The Bulldogs found some line combinations that clicked a more balanced scoring against MTU. The Beavers struggled last weekend at Mankato and have had difficult time getting shots. I expect the Beavers to turn the games into a penalty fest, which should play to UMD's power play strength. The Beavers always seems to over-achieve against the Bulldogs, but I think UMD will get the sweep. Denver at North Dakota: The Pioneers had been playing great but has stumbled recently, making a trip to Grand Forks a possible slump buster. North Dakota has played some good teams this year but have not been able to get on a hot streak. I don't think this will be weekend for UND to find that hot streak, as the Pioneer will not go win-less for 6 straight games; series split. Michigan Tech at Wisconsin: The Badgers got a surprising win on the road last weekend, meanwhile the Huskies came from behind to salvage a tie against the Bullldogs. MTU has been able to score this year their problem has been preventing the opponent from scoring. For the Badgers scoring does not come easy. Bucky's D will hold enough to get a split. Minnesota Twin Cities at Colorado College: The Gophers are again facing tough competition after last weekend splitting with the Mavericks of Omaha. The Tigers split with North Dakota in Grand Forks after laying eggs in their previous four games. Neither team is playing their best hockey right now. I will go with a split, but I think this will be a very tough series for the Gophers. Omaha at Saint Cloud State: Both teams split their series last weekend, both of which were on the road. The split for the Huskies was more of a surprise at Anchorage, but that is always a hard road trip for teams. Both teams match up against each other well and I am going with a split. The series marks a possible turning point in the season. The long offensive drought seems to be breaking, but the defense still is in need of assistance. The three points are good. You should take that for any road trip in the WCHA. The most perplexing part is the way that the tie occurred. Tie games are interesting to examine in how they occur. When UMD tied the Friday night game at North Dakota to salvage one point, the Bulldogs were forced to come from behind to get the tying goal. The point seemed “earned” and the tie was positive. The tie at Michigan Tech this past Saturday night was the result of the Huskies scoring the last two goals of the third period with the game tying goal coming with an extra MTU attacker with 0:50 to play. This tie doesn’t sit well. It was a game that was for UMD’s taking and they let it slip away. The point seems tarnished as much as the point at UND seemed earned. The series was an excellent chance to sweep an opponent at heir place and set the beginning of the middle third of the season off on the right note. Again, you can’t complain about three points on the road, but this really should have been UMD’s first sweep of the year and a four point weekend. Still Looking for a Sweep. Along with UMD, fellow bottom half dwellers Alaska – Anchorage, Bemidji State, and Wisconsin are looking for their first sweep of the season. Surprisingly on the list yet to get a sweep is the team picked by the coaches to be the #2 team in the WCHA, North Dakota. UND is 7-5-2 overall and 4-2-2 in the WCHA. North Dakota has had a two game winning streak, but that was within two series, so not really a sweep. And the lack of sweeps, and wins for that matter, have not gone unnoticed in Grand Forks as murmurings from the team’s rabid fans of questioning the coaching is starting to become more vocal. Dave Hakstol is a great coach and should be given time and leeway to right the ship that isn’t even sinking. Of Note This Past Weekend. Bemidji was swept in Mankato by the Mavericks. The Beavers only scored one goal on the weekend while surrendering nine. Minnesota State Mankato now has a four game winning streak… Visiting Omaha gave host Minnesota Twin Cities all they could handle in a split series where each team won 3-2… North Dakota squeaked out a split in at Colorado College losing Friday 5-3 then winning in OT Saturday only after an extra attacker goal in the third to tie up the game… Wisconsin kept WCHA leader Denver reeling in a split in Denver. The Pioneers are now 1-3-0 in their last four games, all at home… Saint Cloud State had to work to earn a split at Alaska – Anchorage. The Huskies won Friday 4-3 in OT after giving up three goals on UAA’s first three shots. The Seawolves won 3-1 in the rematch. Next Up. UMD will play host to Bemidji State in Duluth next weekend as all 12 WCHA again play in conference series. The match up again should be favorable to UMD and they are games that the Bulldogs need to win to get back into the hunt for home ice. The move to new conference is getting more and more a reality as we move through the season. This weekend marks the first of two meetings of the WCHA defined rivals. The truth is UMD has played Michigan Tech the most of any team in the history of Bulldogs hockey and this will be the last season were these teams will play four games. That said, UMD may miss the games. The Bulldogs have won eight of the last nine in this series going 7-1-1. Overall, though, UMD has found MTU to be pesky in their 118-82-19 advantage over UMD. UMD compares well with MTU. Will home ice be the deciding factor? The 18.7 penalty minutes per game average is still tops in the nation...in the negative way. The Bulldogs last started this slowly in 2005-06 when they had the same record 12 games into the season. Shots and Goals. The Bulldogs have outshot their opponent in 10 of their 12 games so far. They average 32.7 shots per game, 12th in the nation. The problem is that shot are not resulting in goals. UMD scores on 7.4% of shots while opponents score on 11.2% of their shots. Scoring Update. The freshman continue to be the spark to the offense. Their numbers are the highest as shown at right, but they shouldn’t be that close to the top compared to seniors. Bright side…the freshman are promising scorers for years to come. Right now they just the upperclassmen to jump into the fray and use their experience. It’s Urgent. The possibility that the season can be turned around is waning. UMD has the opportunity now to take a stand and determine their place. Of the next 10 games, four are against MTU and two each against Alaska – Anchorage and Bemidji State, all current bottom dwellers with UMD in the WCHA. Additionally, in that stretch UMD plays in the Florida College Classic against Maine for certain then either Ferris State or Cornell. Maine is currently in shambles at 2-9-1 overall, 0-5-1 at home, and nation worst 5% power play conversion. Cornell is currently 4-3-2 and Ferris is 6-4-2. The saying is to make hay when the sun shines. The sun is coming out and UMD will have to cut bait or go fishing. Around the WCHA and Picks by Fiskness. It is one of those rare weekends where are 12 WCHA teams are playing in-conference games. It will be a score board watching weekend to see how the standings change. Bemidji State at Minnesota State Mankato: Both teams played well last weekend should have it should be a close series. They are tied in the standing with nearly the same goals for and against. I will go with a split. Minnesota Duluth at Michigan Tech: The Bulldogs finally got their first win at home while following the game up with clunker. Tech was off the weekend before but prior to that swept the Beavers in Bemidji. UMD always has a tough time with the Huskies and I don't think it will be any different this weekend. The Huskies are the least penalized team in the conference and the Bulldogs are the most. If the Bulldogs stay out of the box they can get a split, but I am going with the Huskies to take 3 points in a win and a tie. Nebraska - Omaha at Minnesota Twin Cities: This is a great match up to see what the Gophers are made of and to determine how real the Mavericks are as well. Surprisingly the scoring edge probably goes to the Mavericks in this one as they are averaging 3.5 points a game to the Gophers 2.88 in conference play. Both teams goals against are nearly identical. I will go with a split. North Dakota at Colorado College: The Tigers lost two non-conference overtime games at home last week and North Dakota earned (or some Irish fans would say given) a split against Notre Dame. The Tigers penalty kill is terrible and their power play is tops in the conference, so the games will likely come down to special teams. I do not see the tigers losing four in a row and will go with a split. Saint Cloud State at Alaska - Anchorage: The Seawolves struggle on special teams and the Huskies special teams has been pretty good. The Huskies will get a sweep. Wisconsin at Denver: The Pioneers are not happy with the outcomes of last weekends games and much the same can be said about the Badgers. However Denver has shown to be a very good team this season, meanwhile Wisconsin has had many struggles. The Badgers power play doesn't exist and their penalty kill isn't great. I don't think the Pioneers are ready to bounce back with the sweep, so I will go with Pioneers win and tie for 3 points this weekend. Offense: D+. There was concern over the offense entering this season with so many high scoring players leaving and freshmen filling the gaps. So far the freshmen corps have looked good and have been the driving force of the offense. That is good, but also bad because the upper classmen, for the most part, are not pulling their weight. The lack of offense has put unnecessary strain on the defense creating a developing train wreck as the season progresses. Top three scorers for the Bulldogs have been linemates for most of the season. They are Mike Seidel (8-6-14), Tony Cameranesi (5-7-12), and Austin Farley (4-6-10). Their points are 47% of the team total and their goals are an alarming 59% of the team total. Pleasant surprises are few. Closest is Joe Basaraba who has three goals on the season, close to half of his output of seven last season. Strong freshman presence is noted from Cameranesi and Farley, as noted above, along with defenseman Andy Welinski (1-5-6) who is fifth in team scoring. We want to see more from last year's freshman scoring leader Caleb Herbert. Herbert is currently goalless with four assists. Team Defense: C-. 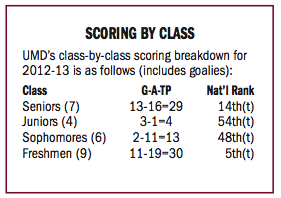 This was supposed to be UMD’s strong suite for the season to get past the freshman learning curve of the forwards. In reality, it is one of the most frustrating aspects of the team. The defense has struggled at times with basic positioning, keeping leads late in games, and keeping possession of the puck. 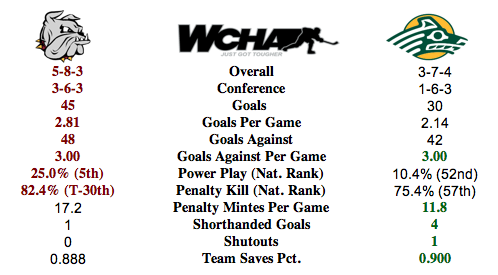 As a result, UMD has given up an average of 3.08 goals per game. Not horrendous, but close to horrendous and not what was expected. None of the defenseman corps is in the positive range for plus/minus rating. Of all players, only Farley, Dan DeLisle, and seldom used Max Tardy are positive with +1 each. Strong freshman presence from Andy Welinski who is providing a great offensive presence from the blue line. We want to see more from last year's defensive stronghold Wade Bergman. Bergman was held goalless until last weekend and has logged a team low -8 in the plus/minus rating. Special Teams: B-. This is the brightest spot of the team. UMD has the nation’s 8th best power play that is connecting at 23.7%. The penalty kill is also decent at 81.4%, but they are on the ice too much. UMD has the highest penalty average in the nation at 18.7 minutes per game. Seidel, Cameranesi, and Farley lead the team in power play goals with 10, 71% of the team's total. Goaltending: C+. Goaltending has not been stellar, but it has been good enough that UMD should have more wins. Newcomer Matt McNeely is playing well for a freshman behind this team defense. 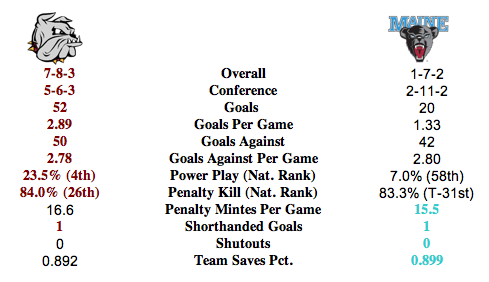 McNeely is currently at a 0.888 saves percentage with a 2.95 goals against average. Aaron Crandall again this season is there, but not excelling with 0.889 and 3.15. 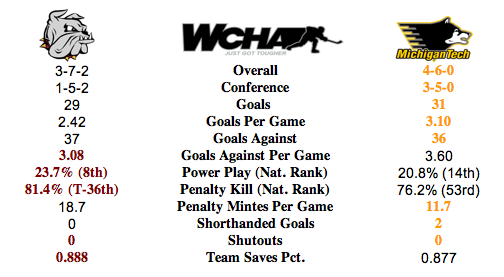 The stats the UMD netminders have put up place them above only three tenders in the WCHA. It is still unknown as to who is the number one, but McNeely looks to be a solid goaltender for the future and a good one for the current season. UMD is without a shutout this season. Coaching: B. The struggles are there, but they are likely growing pains that must be endured as the team matures. Coaching will expedite the process and Sandelin is a great coach to have. What is at issue is the number of penalties and penalty minutes. The team plays undisciplined hockey and that can be helped from the top. What is most alarming is the number of 10-minute misconducts the team has taken that are not associated with another penalty. That is the sign of frustration, which is understandable, but it more a symptom of undisciplined play. Overall Team: D+. We didn’t and don’t expect a top three WCHA team, but we do see more than 11th place from this team. The pieces are there, but they are not working together for a common goal. Small gains in one facet are usually coupled with a step back in another facet. The team has time to come together, but will it be for the better of this season or seasons in the future? Looking Ahead. The next “period”, or third of the schedule, brings some favorable games for UMD. They play Michigan Tech twice, Bemidji State, and Alaska – Anchorage, all teams just above or below UMD in the WCHA standings. These games will show just where UMD willfinish at the end of the season. Splitting these series will probably not be enough for UMD to make any significant moves in the standings. The other games include the Florida College Classic and a pair of games at Colorado College. UMD is 1-4-1 against fellow furture teams of the NCHC so far this season. The Bulldogs have six more games against future NCHC left. The next grading period will end after playing at Colorado College on January 19, 2013. Hey, first conference win for the Bulldogs this past weekend. The game was messy, each team had chances to win and lose the game, but the Bulldogs did what they had to do to pull out the win. It was a good first step, a door that opened to something good. Saturday was the closing of the door. Actually a slamming of the door. Whatever the Bulldogs pieced together and gained Friday against SCSU was lost in a 5-1 drubbing. Disheartening after the hope from Friday. But in the end, we looked at the last two series, at North Dakota and home against SCSU, as a place to start by getting one win. The Bulldogs exceeded that small expectation and gained three of a possible eight points. Baby steps, man. Elsewhere in the WCHA. Bemidji hosted Alaska – Anchorage and took three points. With that, BSU helped UMD stay out of the basement of the WCHA and left UAA as the only team yet to get a win in the WCHA. With UMD in 11th place is Wisconsin who was swept at home to the pesky Minnesota State Mankato team. MSUM won both games 4-2 and never trailed in the weekend. Denver and Colorado College swapped opponents on the weekend as they both played Yale and New Hampsire. The results were not good for either WCHA team. Denver was swept and CC managed to earn a tie with a loss. North Dakota traveled to Notre Dame in search of their first sweep of the season and they failed. North Dakota won Friday, but succumbed to the Irish Saturday. Minnesota Twin Cities made a regular season trip to the east coast for the first time since 2005 and swept the host Catamounts of Vermont.